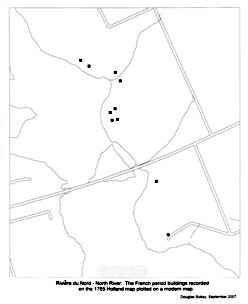 By using the 1765 map of the French Acadian settlement of Rivière du Nord drawn by Samuel Holland and the computer program MapInfo, Dr. Doug Sobey has plotted the location of Acadian homes of the Upton Farmlands on a modern map, seen above. The map is bisected by the TransCanada Highway as it crosses Poplar Island; Maypoint and Beachgrove Roads can be seen to the lower right quarter of the map and Upton Drive in the top right quarter. Dr. Sobey shows 10 Acadian homes on the Upton Farmlands property. According to a 1752 census, the land was given to the families of Rivière du Nord verbally by Monsieur de Bonnaventure, the Commandant for the King at Ile St.-Jean (a former name of Prince Edward Island). Family names included Landry and Daigre. They earned their living by sowing and harvesting wheat and also owned various stock animals; pigs, sheep, cows, chickens and oxen. This entry was posted on October 22, 2007 at 11:30 am and is filed under History. You can follow any responses to this entry through the RSS 2.0 feed. You can leave a response, or trackback from your own site. My family lives in West Keppoch and I’m very interested in finding more information about Acadian settlement in the Hillsborough Bay area. If anyone can forward any links etc related to this article or contact info for Mr Sobey I’d greatly appreciate it. Tanks in advance.